Introduction and political statement of the 1970s libertarian socialist Workplace Organizing Committee and their paper Against the Grain. 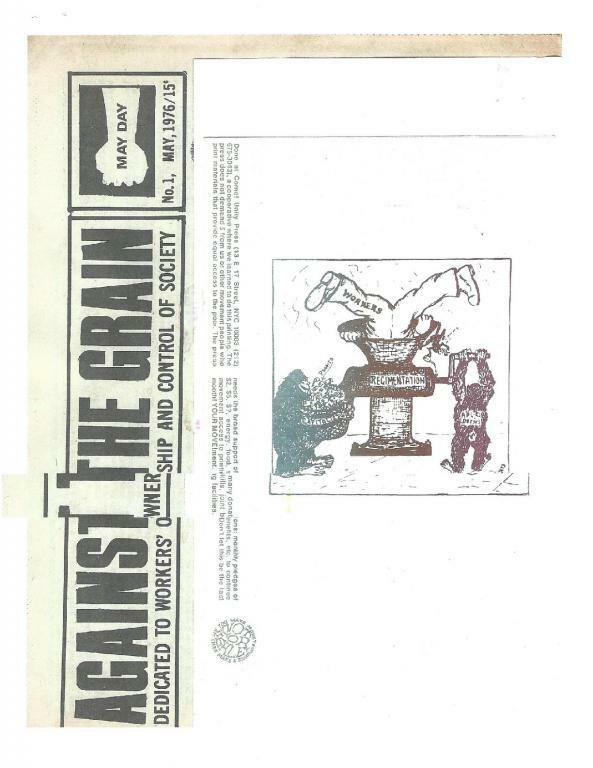 The NYC 1970's Workers Organizing Committee and the newspaper "Against the Grain" were a direct result of several converging factors. Three main elements were the independent libertarian and independent socialist organizing efforts of workers in three important NYC 1970 economic sectors: a) public, health care and taxi; The 1970s NYC's fiscal crisis and the bankruptcy of the City lead to massive demands for public worker concessions of wages, health care and conditions of employment; c) Political shifts and changes by a number of founding members and active militants away from traditional socialist perspectives toward libertarian socialism. The editorial collective was composed a balance of libertarian socialists, anarchists and anarcho-syndicalists. Two founding members were to become active in the Libertarian Workers Group. "Against The Grain" published for a few years and remained a respected, independent publication throughout its years of publishing. Scanned for libcom.org by New York/New Jersey Workers Solidarity Alliance archives.